The complete revision (rSADA) of the Swiss Animal Diseases Act (SADA) not only affects farmers, but the entire population. In its current form the law puts corporate interest above public interest. 1) Undemocratic concentration of power with the Swiss Federal Government and the Federal Veterinary Office. Through imposition of conformity on all cantonal (state) veterinary inspection offices our federal system will be transformed into a centralized authority. This will create a significant potential for abuse of power. 2) Loss of national sovereignty. Rule by foreign powers. The Swiss Federal Government is empowered to sign international treaties all by itself. This allows for the possibility of foreign policy being automatically introduced and Swiss law being leveraged out by contradictory statutes. This puts Switzerland in danger of being ruled by international organizations. Previous experience with conflicts of interest urge us to be careful: in 2009 WHO and its advisors, some of which held close financial ties to vaccine producers, raised the swine flu pandemic alert level to the maximum. 3) Disempowering pet owners, livestock breeders and veterinarians. Putting limits on our right to object. Our assistance in questionable coercive measures – for instance in the interest of multinational corporations – will be enforcable by unlimited fines, and even more severe sanctions and prison sentences. 4) High costs for controversial preventive programs and vaccine stocks. Disposal of superfluous vaccine stocks or incentive to order forced administration. The foreseeable runaway costs will be charged to animal keepers, tax payers and consumers. 5) Oppression of naturopathic remedies and treatments through subsidization of mostly toxic pharmaceutical products with taxpayer money. As a consequence toxic residues in our food. 6) No duty for authorities to provide scientific evidence as a basis for their decisions. The law defines no objective criteria for the definition of pandemics and requires neither scientific evidence or independent risk analysis. A lack of transparency enables the Swiss Federal Government and the Federal Veterinary Office to arbitrarily proclaim pandemics and order mandatory vaccinations. 7) No compensation for vaccine side effect. Neither official documentation of frequently occurring side effects nor compensation for any damage caused by them are regulated. 8) Bee extinction. Foreseeable extensive mandatory treatments of bee colonies with formic and oxalic acid, which are proven to cause severe side effects. Bee keepers who work with natural methods, and thus refuse such unnatural and potentially harmful treatments, may be punished by law.. The reintroduction of the wild honey bee will be prevented. The wild bee is crucial for the preservation of a healthy gene pool of the entire species and therefore vital for its survival. As a consequence – worsening of bee extinction. 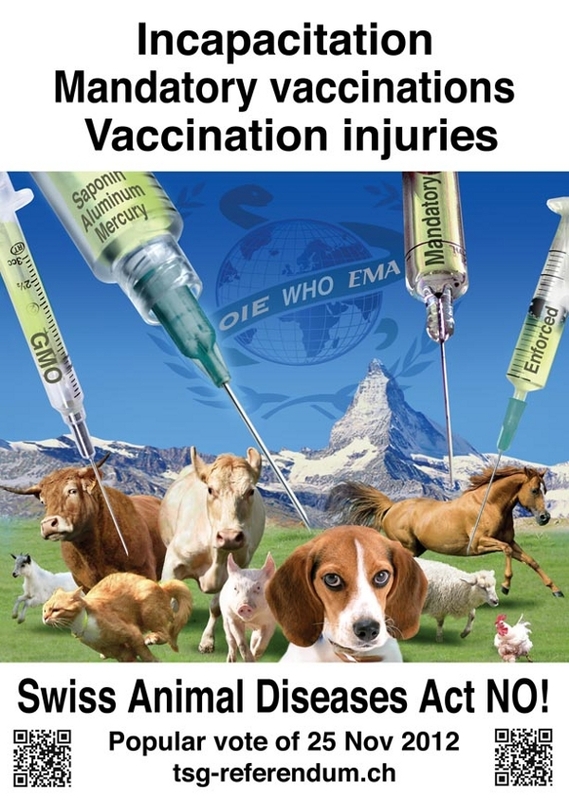 9) Disregard of animal protection by forcing medication using mostly toxic, genetically engineered products. Many pets and domestic animals suffer from severe side effects. 10) Most members of the Swiss parliament only voted for to the revised Swiss Animal Diseases Act, because they are overloaded with new bills. Thus they have not sufficiently studied the revised bill and as a consequence had to rely on the recommendations of their colleagues in the science commissions. The members of the two commissions again largely relied on the recommendations of the Federal Veterinary Office and multi-national corporations. As a Swiss citizen it is in your vital interest to reject the bill because the revision was largely driven by special interest and a desire for centralization of power. With your NO you’ll give us the opportunity to propose an alternative revision of the bill, which will be in the interest of the public. Freedom of choice for the health of humans and animals. Vote NO on the revised Animal Diseases Act.